Her Majesty, The Queen, accompanied by His Royal Highness Prince Philip, officially opened the £120-million Milngavie Water Treatment Works in Scotland recently by unveiling a commemorative plaque in the presence of leading dignitaries, according to an Aug. 11 press release. Black & Veatch, an engineering, consulting, and construction company, was the main contractor on the project, which provides top quality drinking water to 700,000 people in the Greater Glasgow area. The state-of-the-art facility forms the largest water treatment investment project in Scotland. To mark the occasion, Scottish Water organized a grand luncheon with guests that included Scottish Water executives and the project team, as well as representatives from Scottish Water, Black & Veatch, and other core team partners. Also present were key stakeholders and VIPs, including members of Scottish Parliament, district councillors, the Environment Agency and representatives from a local school who have been following the progress of the project for nearly four years. During her visit, the Queen was introduced to Black & Veatch professionals, including Executive Managing Director for Black & Veatch's water business, Bruce Ainsworth and Managing Director, UK Water Utilities, Tony Collins. John Marshall, Black & Veatch project manager, explained the operations of the lamella wash water recovery system, while Hugh Maclennan, Black & Veatch mechanical & electrical manager, had the opportunity to explain the operation of the filter system to the royal party. Reflecting on the day's events, Bruce Ainsworth said, "It was truly an honor to have one of our most high-profile projects be officially opened by the Queen. Black & Veatch is proud to have contributed to this historic scheme, which has resulted in Glasgow getting a new sustainable water supply fit for the 21st Century." The multi-faceted Katrine Water Project includes an ultra-modern treatment works, two covered reservoirs, a pumping station, a system of tunnels and intake structures, and a number of other network improvements to complement and significantly extend the overall operation. The project was delivered £10 million under budget and ahead of Scottish Water's time schedule. Parliament passed a bill to create the Loch Katrine Water Supply Scheme in the mid-1800s and placed the provision of water under municipal control. 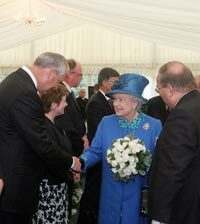 The original plant was officially opened by Queen Victoria, The Queen's great, great-grandmother. This 150-year old plant is no longer in operation following the switch to the new water supply in October 2007. This was to ensure that the daily service to homes and businesses remained uninterrupted while the construction of the new plant progressed. Water treated in the new works flows by gravity along 26 miles of aqueducts from Loch Katrine to Milngavie. After treatment, water is stored in the two cavernous reservoirs at Milngavie, Barrachan, and Bankell, the latter having been covered over with turf to blend in with surrounding pasture land. The new works is supplying people living in Glasgow, parts of West and East Dunbartonshire, East Renfrewshire, Renfrewshire and South Lanarkshire. In order to allay concerns about the project's impact upon the surrounding environment, the new works at Milngavie are partially below ground and screened by trees and extensive landscaping. To further reduce the works' footprint and therefore visual impact, Black & Veatch used lamella clarifiers rather than cone sludge settlement tanks and relocated the filter gallery pipework.